The roots of Universal Audio stretch back to the 1950s and the company is unusual in being equally respected for both its heritage analogue gear and cutting edge digital technology. Even analogue enthusiasts – this writer included – have found themselves blown away by Universal Audio’s digital models of classic studio equipment. With the OX, Universal audio has used its expertise in both fields to create a reactive attenuator combined with highly sophisticated speaker, cabinet, microphone and classic effect simulations. It’s a substantial but stylish unit housed in a metal case with a classy front edge of solid maple. There’s an amp-style jewel light and the five control knobs are colour coded to correspond with the digital and analogue functions. All of the important writing on the back panel is printed upside down, too, as this becomes the right way up when you’re standing in front of the OX and looking over the top of it. You’ll find mono/stereo line level outputs, an impedance selector offering four, eight and 16 ohms and sockets to connect an amplifier to the OX and the OX to a speaker. There are also RCA and optical SPDIF outputs and three USB ports that are intended for firmware updates as they become available. Currently the footswitch socket serves no purpose, but this will almost certainly come into play in the near future. Physical connections to and from your amplifier are made via mono jack sockets. 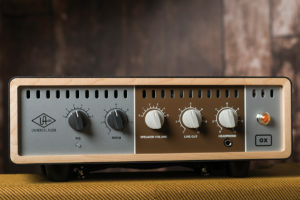 UA produces several guitar amp plugins designed for computer recording, including the Fender ’55 Tweed Deluxe that we reviewed in June 2017. The plugins model the amplifiers along with various speakers and cabinets, and all the processing is done within Universal Audio’s various audio interfaces. In the case of the OX, the DSP is contained within the unit itself, so you can take it to a gig or a studio and use it independently of a computer or tablet. There’s no amplifier modelling because it’s designed for use with your real-life, living, breathing valve amplifier. The amp output passes through the OX via its stepped attenuator and the modelled speaker outputs are entirely separate. If your primary interest is attenuation, the manual and quick start guide barely require a glance. Simply connect the OX to its power supply, your amp and speaker to the OX, power up and use the speaker volume control to set the level coming through your speaker. The attenuator is very transparent and there’s no loss of treble or clarity, however the stepped level switching is less flexible than the controls of some reactive attenuators. The digital connections are restricted to 44.1kHz so we opt for the analogue stereo line outputs plugged directly into our audio interface. The OX software is downloaded from UA’s website and installed. We select the OX wifi hotspot from our computer’s drop-down menu, enter the OX’s assigned password and launch the software. Once we’re in, the interface is clear, comprehensive and impressive. There are three channels – two for close mics that can be switched on and off axis, and a third for a room ambience mic. On each channel you can select a classic dynamic, ribbon and condenser microphone model – with two choices of each. Every channel has solo, mute and bass-cut switching, with individual equalisation. They route to the master fader and EQ, compression, delay and plate reverb can be applied globally. If you prefer, you can pan each channel hard left or right to record each mic onto separate tracks, or separate the close mics from the ambience. Clicking the cabinet tab gives you 17 familiar cabinet and speaker types. Virtual input levels are 50 watts and 100 watts, and there’s a speaker drive control that changes the compression and overdrive characteristics of the selected speaker model. Compared to cheap and cheerful guitar amplifier modelling technology, Universal Audio plug-ins are subtle and sophisticated. However they are also very intuitive and fun to use. Selecting the virtual equivalent of the physical speaker in a couple of our test amps and comparing them, the OX sounds exactly like a well mic’d version of the real thing. In effect, Universal Audio has simulated a typical mixing desk-based pro recording set-up for electric guitar, complete with multiple mic channels and all the commonly used effects. It’s powerful, versatile, extraordinarily convenient and sonically we can identify no downside. Despite a lingering suspicion that the OX will benefit from future software updates as a result of user feedback (as is commonplace in the tech industry these days), it’s already a fine attenuator and a uniquely wonderful tool for live work and recording. If you are only looking to crank up your amp at sensible volumes then there are numerous cheaper and more sophisticated options out there, but the OX offers so much more than an attenuator with some cabinet emulations thrown in for good measure. On the recording side, the clincher is whether the OX sounds as good, if not better, than a conventionally mic’d cab. If you have access to a great-sounding recording room and a selection of the finest classic mics, compressors, equalisers and reverb effects, then the old-school approach will likely still win out, but we would have absolutely no reservations about using the OX on a professional session. For most guitarists in the real world, the usual modus operandi is to record amps in a back bedroom, cupboard or project studio vocal booth using an SM57, and compared to those approaches, we believe the OX is infinitely preferable. In addition to superior tone and flexibility, the neighbours won’t complain, extraneous noises are a non-issue and spillage is eliminated. The same goes for mic’ing up on stage. It’s not perfect: the wifi-only connectivity, stepped attenuation, fixed sample rate and unassigned footswitch could all be improved, but we anticipate that some of these misgivings will be addressed as upgrades become available. The OX will almost certainly evolve and improve over time, but for now, it’s already a fantastic and groundbreaking product. • CONTACT Universal Audio www.uaudio.comThe post Universal Audio OX Amp Top Box appeared first on The Guitar Magazine.